Love Hina is the story of Keitaro Urashima, a two times Ronin with aspirations for Todai. When he finds himself without a place to stay, he turns to his Grandmother’s traditional Japanese style inn. However, as he soon discovers, the inn has been converted to an all-female dormitory. After a failed attempt at cohabiting with the eccentric residents of the Hinata Inn, Keitaro tries to leave. Only to receive a letter from his Grandmother, naming him the new manager of the Hinata Inn. Love Hina is part an examination of the stress the importance of making it into a good university places on modern Japanese youth. But mostly it’s complete and utter chaos. There are two things I like in manga, comedy and a straightforward romance. Love Hina provides a mixture that is just about right. While the comedy can be forced at times, and the same old joke gets recycled far too often, the romance makes it a series worth considering for fans of the genre. There is no doubt as to who the romantic couple is, and while that may not be for some, for others it provides a love story that doesn’t ask the reader to suspend their disbelief that the two could ever not be together. Anyone considering buying the omnibus editions is most likely already a fan of the series, and doesn’t need much talking to about the story itself. 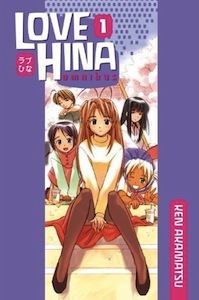 Love Hina has its following, and most people that have ever been interested in it have already dipped their toes. What it comes down to is if this new edition is worth the double dip. Normally I’m not a fan of omnibus volumes. The spines tend to break far too easily, and for a purist collector such as myself I prefer to have the individual volumes. In this case, however, I have to say that I’m quite impressed by the quality of the book. The cover and spine are flexible, allowing readers to read without worrying about destroying their copy. The new translation flows naturally, though there are a few moments where some proof reading would have been useful, as letters are forgotten from the middle of words, or entire words are left out of sentences. These are things I imagine will be fixed in later printings, though I’m a little disappointed that no one caught the errors before this initial print. Overall, the omnibus is a solid product. Despite the few content errors, Kodansha has managed to make an omnibus that promises to survive several read throughs, and provides three times the reading material, at barely two times the cost of a regular manga volume. The overall design is pleasant, making it a worthwhile collectors item. Highly recommended for fans of the series, and especially recommended for anyone looking to get into it for the first time. The first volume serves as a good introduction to the series, and is much more affordable than any of the old Tokyopop editions being sold on Amazon. Review copy provided by Kodansha Comics. NaNoWriMo – Yes I Did It!